Australian Developer Witch Beam has just released its arcade-style twin stick shooter Assault Android Cactus on PC, Mac and Linux. Taking place on a spaceship commandeered by rogue robots, it’s up to Junior Constable Cactus and her fellow android heroines to blast their way through intense and dynamically changing levels in order to get to the bottom of what is causing the robots to go berserk. Each of the nine playable androids comes equipped with their own primary and secondary weapons, dictating their style of play. Cactus is the capable all-rounder, picking off enemies with her assault rifle and charging in to deal big damage with her flamethrower. Coral prefers to get up close to maximize the effectiveness of her shotgun, but can drop an enemy repelling plasma field to keep in control of the battleground. 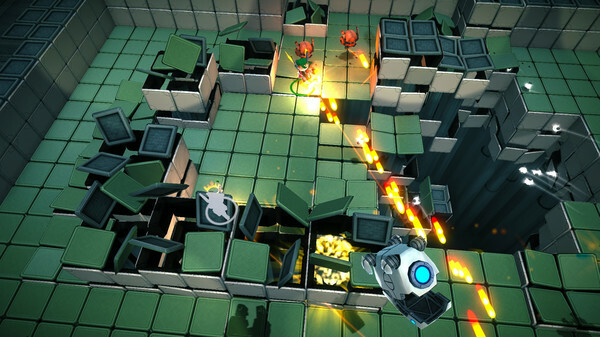 Assault Android Cactus’ gameplay revolves around its battery mechanic, which rewards an aggressive style of play. The androids’ batteries constantly drain throughout a level, and if fully depleted will shut down a character and end the level. The only way to restore power is by picking up batteries from fallen enemies. We’ll be playing this extensively on Playstation Vita when it comes out on PSN early next year, but we can already tell from our time with the PC version that this is a fun take on the twin stick shooter genre. It dares to be different, both visually and in terms of gameplay – where personality traits of the different characters play a large role. On the Vita, the twin stick shooter is a genre where Geometry Wars reigns supreme, so we look forward to seeing how well this will convert to the small screen. Find out more about the game by visiting http://www.assaultandroidcactus.com/p/landing.html – and remember that it’s out right now if you prefer to play on PC, Mac or Linux!